No matter where we go, people love the sleek modern look of the Portland Loo, which is actually the result of designing it with and for the city staff that maintains it! The Portland Loo is the only public toilet designed and built specifically for maintenance first, and only secondarily for the people who use it. This has been the primary reason for its success. When Portland’s City Council originally had the idea for The Loo, there was a rise in the city’s tourist and homeless population. Without restroom facilities, this population was left to find somewhere else to take care of business. The city realized that having a restroom open 24 hours a day with full public access would alleviate the need to disturb local businesses for their restroom facilities. They felt this solution would also help with sanitation, to prevent waste throughout public and tourist areas, as well as the spread of disease. So we worked with Portland City staff and officials to develop the design of every little knob and component. Everyone knew well the history of nightmare issues that had occurred with other city toilets. Many had tried similarly to build a restroom open to the public 24/7, but have seen big disasters and wasted millions of dollars. Their problems often occurred because they designed it for the end user – so it resulted in too much privacy and maintenance cost, ultimately leading to quick damage and illicit activity. In contrast, when designing the Portland Loo, Madden Fabrication created a public toilet that would be easy to maintain while also preventing common problems – such as vandalism, illegal drug use or prostitution. We took the time to get it right with ingenuity and input from police, fire, park staff, engineers, and more. Every purposeful feature is built in to create a self-contained solution. The result is a public toilet that’s a virtually indestructible and safe lavatory. It’s easy to clean, and nothing can be ripped off the walls or easily damaged. Made with components that are commonly used by many cities, they’re easy to replace or upgrade. And because it’s a single stall, it’s gender neutral and can still take about 300 flushes per day, comparable to an airport restroom! The first Portland Loo was installed over 10 years ago, and it still looks almost brand new! 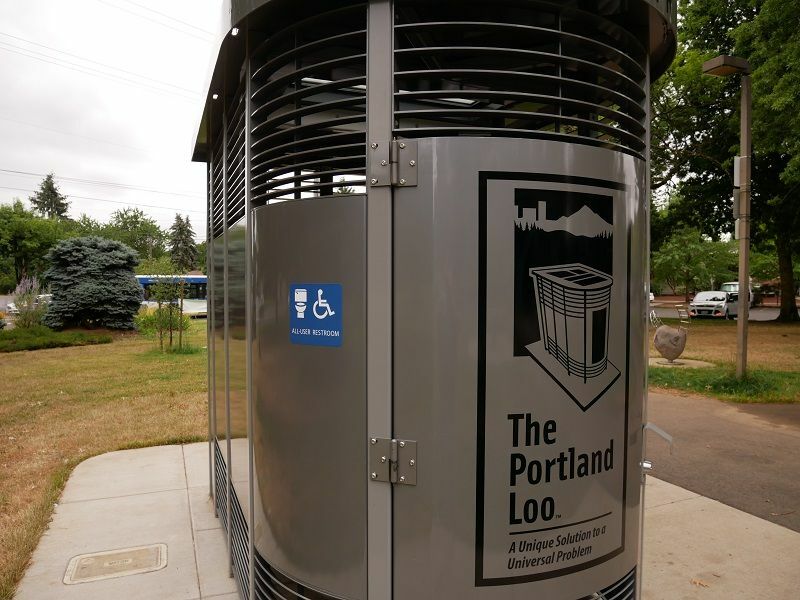 If you need a durable and inexpensive solution to reducing crime and waste in your parks, transit stations, or other populated areas, we invite you to join the many other cities also enjoy the look of The Portland Loo.